This is the second version of the gladiator game that we all liked and it is very much improved. The goal remains the same, meaning that you have to survive the arena of death. Create your very own champion, select his skin color, hair style and name him. After you have done that, the stats should be improved and depending on your play style you can go either really offensive, defensive, or somewhere in between for a more balanced hero. Winning duels in arena will surely make you alot richer both in experience points and you can spend both on buying armor and increasing your stats even further. Once you are confident enough you can start a tournament and if you win there will be lots of gold waiting for you. If you lose though, you will need to pay a fee so your hero does not die. a game developed by playaholics is always a good game. Use the mouse to navigate through the game and fight in the arena. 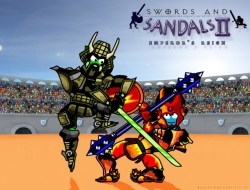 Swords and Sandals 2 8.85 between 0 and 10 based on 153 votes.